Slowly but surely, video games are starting to become associated with keeping fit. We have the extraordinary popularity of the likes of Wii Fit and Kinect to thank for this, and to be honest I’m a little surprised that fast food companies haven’t tried to get in on the act to help improve their images. A McDonald’s branded sports mini-game package for Wii, perhaps? Or a game which involves jogging down virtual streets from one Subway to the next? If you haven’t already guessed, my full time job isn’t as a game designer. Fast food companies and video game developers have done deals many times before though. One of the earliest examples is Ocean’s Mr. Wimpy: The Hamburger Game, released on the likes of Spectrum and Commodore 64 back in 1984. For our American readers, Mr. Wimpy is (or possibly was) a giant hamburger dressed like a London Beefeater and has absolutely nothing to do with Popeye. The game itself? Not too bad, although it did leech quite a few ideas from Data East’s 1982 arcade game Burger Time. Out of pure coincidence, Data East were actually responsible for the first McDonald’s game – Donald Land for the Famicom, released in Japan in 1988. The strange name stems from the fact that Ronald McDonald is known as Donald McDonald in Japan. There isn’t much to talk about – it was a pretty generic platformer with Donald/Ronald himself appearing in a rather badly drawn fashion. The rest of the McDonald’s games have all been surprisingly good. That said, perhaps it isn’t a surprise given their heritage – Treasure made McDonald’s Treasure Land Adventure on Mega Drive, while Sega themselves published McDonald’s: Donald no Magical World (Ronald McDonald in Magical World) on GameGear. More on those in a couple of paragraphs. McDonaldland (known as M.C Kids in the US) was released on an array of formats (NES, Game Boy, PC, Amiga and Atari ST) in 1992 by Virgin and had a couple of nice ideas. The best of these was the ability to walk upside down to access new areas. Much like Super Mario Bros. 3 there was a map screen allowing the picking and choosing of levels and the music was suitably jolly. You could choose to play as either Mick or Mack (did Virgin think McDonald’s is an Irish corporation?) who had different skin colours and hairstyles but no different abilities. Bizarrely, the Game Boy version was later re-skinned and released in the US as Spot: The Cool Adventure. That’s Spot as in the 7-Up mascot, not the dog from the kid’s books. Mick and Mack then went to star in Virgin’s Global Gladiators. Although Game Boy and SNES versions were developed they couldn’t be released due to legal reasons, thus it only ended up on Mega Drive, Master System, GameGear and Amiga. 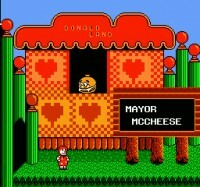 It had a less child-like feel to it than McDonaldland with Ronald only appearing at the start of each level. It was so loosely based on the McDonalds brand, in fact, that in a recent issue of Retro Gamer, programmer David Perry – of Earthworm Jim fame – reported that McDonald’s were befuddled as to where the burgers were. Ronald McDonald had pride of place in both Ronald McDonald in Magical World and McDonald’s Treasure Land Adventure. The first was a Japanese exclusive for the GameGear and a very colourful one at that, with a jaunty musical score. The story involved Ronald trying to rescue his friends who had been trapped inside a map by a wizard called Mr. Joke. The Mega Drive offering is also very colourful; even more so than any of the Sonic games. Despite the exterior it was quite a challenging game, and it is now harder to find than a McDonald’s apple pie served at a lukewarm temperature. The McDonald’s games don’t end there. In 2001 TDK released McDonald’s Monogatari: Honobono Tenchou Ikusei on Game Boy Color. An adventure game in design, it had a graphical style and perspective very similar to Pokemon. There’s only one copy on eBay at the moment, suggesting that it too is quite rare. 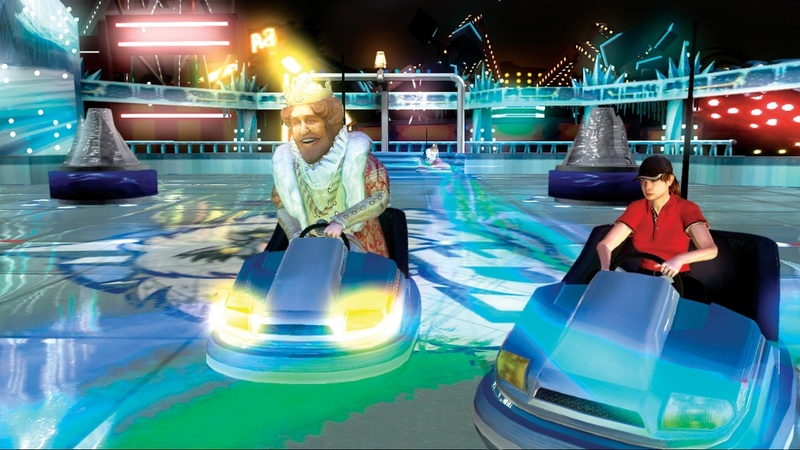 The rather sinister King from the Burger King adverts starred in not one, not seven, but three Xbox games. These came to exist after Burger King ran a questionnaire asking what customers would most like to take home from a visit to one of their restaurants. The most popular answer was a video game and so a deal was done with Blitz Games. Ironically, Blitz are based in the UK, but the trio of titles were never released outside of the US. Priced at $3.99 a pop, and only available if you purchased a value meal, two of these even featured online play. Big Bumpin’ – bumper cars with power-ups, essentially – was the best of the bunch, followed by the Mario Kart-style PocketBike Racer, and lastly the slightly twisted Sneak King, which involved sneaking up on people and surprising them with greasy treats. Although all three are incredibly common on eBay, and also very cheap to purchase, they are sadly region locked.